Golden Age of Hollywood Glamorous Hats are a specialty of Dallas Vintage Shop as well as Hollywood Classic Movie Character Costumes. The famous Audrey Hepburn, My Fair Lady hat, shown here, is just one example of the kind of Golden Age of Hollywood Glamorous Hats we keep in stock. We have a huge collection of Golden Age of Hollywood Glamorous Hats for the Kentucky Derby, The Mad Hatters Tea & Luncheon at the Dallas Arboretum or other Spring Hat Events in the DFW area. Unbelievably Beautiful is this Audrey Hepburn, ‘My Fair Lady’ inspired hat. This Vintage Hollywood hat was specially made for The Golden Age of Hollywood, Mad Hatter’s Tea & Luncheon Event at the Dallas Arboretum and it is just one example of the kind of Vintage Hollywood Glamorous Hats we have in stock. Get Golden Age of Hollywood Glamorous Hats, Costumes & Accessories for all your favorite Old Hollywood Movie Stars and Classic Movie Characters complete outfits. Now you can have a Hollywood Stars, Grammy Cat Walk Themed Party or Gala. We have what you need. Remember, these Golden Age of Hollywood Glamorous Hats are one of our specialties. 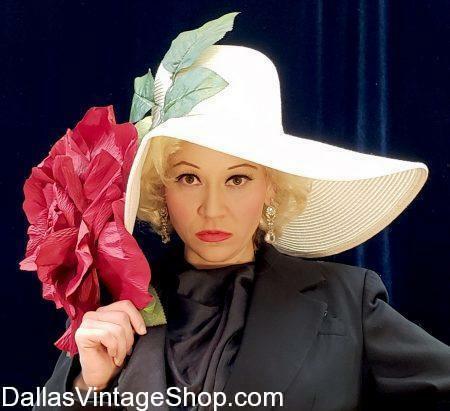 Many of the fabulous Vintage Hollywood hats are one of a kind recreations, so get to Dallas Vintage Shop and get the Hollywood Vintage hat of your dreams. You can also get Hollywood Classic Movie Character Costumes. Hollywood Diva hats range form special supreme quality hats to median and economy prices. We can customize your hat right on the spot if you prefer your own unique, one of a kind creation. We have an unlimited supply of feathers, flowers, tool, lace and beautiful sprays to add to your hat. See more Ladies Hats here. Mad Hatter’s Tea Info here. This dramatic Golden Age of Hollywood Ava Gardner Hat is now available at Dallas Vintage Shop. Shown here is the Golden Age of Hollywood Ava Gardner inspired hat. This Vintage Hollywood Iconic Starlet outfit & hat is now available as well as other Hollywood Classic Movie Star hats and outfits. Our Classic Hollywood Hat Collection is unlimited and we keep articles like this in stock always. The Golden Age of Hollywood Ava Gardner hat that you see here is a one of a kind creation that is available, only one per season, to guarantee that no one else shows up to your event with the same hat. Don’t worry, there are plenty of other unique, iconic Hollywood Movie Star hats and Vintage Hollywood classic hats in our collection that are equally great for The Mad Hatter’s Tea & Luncheon at the Dallas Arboretum. Get ‘Show Stopper’ hats for the Kentucky Derby and other Tea Parties, Red Carpet Parties and Costume Events. Let us customize your Derby Dame hat right in our Hat Shop Department while you wait. We are fully prepared with an incredible arsenal of hat embellishments and ideas to help you individualize your hat or make sure it matches the color or style of your dress or special event outfit. Hat prices range from Supreme Celeb Status creations to median or economic choices to fit your budget. Anytime you need dramatic Golden Age of Hollywood hats and costumes we are here for you. This Ava Gardner hat is just one example of our unlimited supply of Classic Hollywood characters outfits available at Dallas Vintage Shop. Our collection of Iconic Hollywood Ladies Hats, like this Marlene Dietrich, ‘The Devil is a Woman’ Movie hat is at Dallas Vintage Shop. See the largest collection of Iconic Hollywood Ladies Hats in the Dallas Metroplex at Dallas Vintage Shop. You will find many one of a kind, specific Hollywood Character themed hats that we make especially for the Dallas Arboretum Mad Hatter’s Tea & Luncheon or for the Kentucky Derby and many Tea Parties and Social Events in Dallas. Many of the Hollywood Iconic hat recreations are limited to one per season. That keeps very specific hats from showing up at the same event. We also customize your fabulous, already gorgeous hat right at the time of purchase from our unbelievably enormous supply of beautiful, pre-made hat embellishments created from an assortment of exotic feathers, fabulous flowers, large & small, interesting netting, tool & horse hair materials and sometimes amazing & complimentary broaches. We absolutely want to help you make sure your hat is a unique, individualized creation. Choose from a huge assortment of Iconic Hollywood Movie Star’s hats including the Marlene Dietrich hat and costume shown here. Nobody, anywhere has more Hollywood Movie Starlet costumes & hats, Golden Age of Hollywood hats and Mad Hatter’s Tea hats than Dallas Vintage Shop. Marlene Dietrich is a major Hollywood Icon, famous for her array of gorgeous, if not unusual hats. We have many of those Marlene Dietrich inspired hats as well as other Hollywood Iconic Starlet hats, Old Hollywood Movie Star hats, Hollywood Famous Character hats and all of the Golden Age of Hollywood costumes & hats you can imagine. These Vintage Hollywood Diva hats range from exclusive celebrity status ones to median and economy priced hats that fit your budget, and there is always a huge supply in stock, all year round. Golden Age of Hollywood Hats are available at Dallas Vintage Shop. This Kate Winslet, Titanic Movie, inspired hat is just one of the Mad Hatter’s Tea & Luncheon hats that we’ve created especially for the Dallas Arboretum’s ‘Golden Age of Hollywood’ Themed Event. We have one of a kind hats, giant hats and eclectic hats in stock all year round. There are many more Hollywood Starlet inspired hats in our huge collection. We have Dallas’ largest selection of Golden Age of Hollywood Hats like this Kate Winslet, Titanic Inspired Hat. Our huge selection of Golden Age of Hollywood Hats are always a big hit. We have specially made Hollywood Starlet hat recreations galore. 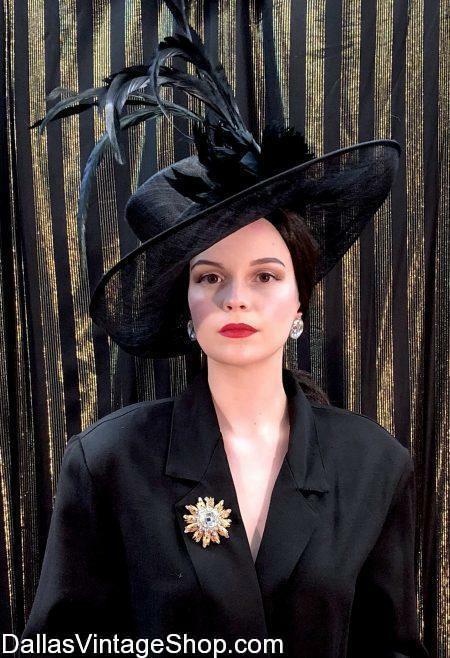 The Kate Winslet, Titanic inspired hat, shown here, is only one of our Hollywood Starlet hats that we have made just for the Dallas Arboretum’s Mad Hatter’s Tea & Luncheon. For the most gregarious Vintage Hollywood hats you’ve ever seen, come and get them while the selection is at its best. 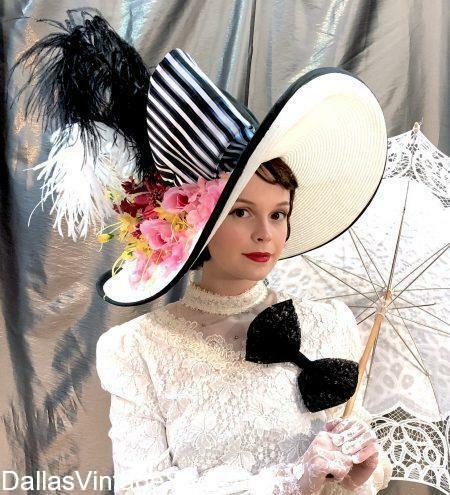 The Dallas Arboretum Tea & Luncheon is almost here so come and get the best hat ideas from Dallas Vintage Shop’s Golden Age of Hollywood Hat Collection and get ready to show off. Don’t forget that there is a hat contest. You will never find a larger selection of Golden Age of Hollywood hats anywhere. 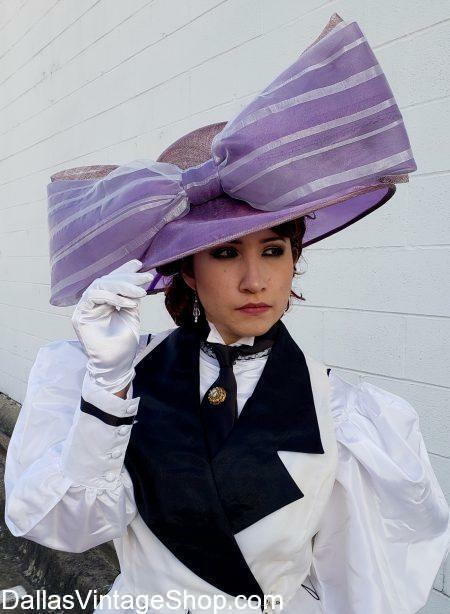 If you like this Kate Winslet Titanic inspired hat, you’ll love our other Hollywood Movie Star famous hat recreations made just for the Mad Hatter’s Tea & Luncheon. Find Glamorous Vintage Hat Fashions, Hollywood Recreation Hats and Iconic Hats from Classic Movies here. Keep in mind that we have the largest collection of Gigantic Hats, Vintage Hats, 20’s, 30’s, 40’s, Latest Fashion Hats, Large Hats, Fascinators, Whimseys, Famous Movie Character Iconic Hats, Derby Dame Hats, Victorian Riding & Driving Hats, Steampunk Hats and Hats from any Century or Decade. Let Dallas Vintage Shop help you discover an already finished hat or let us customize your hat with our enormous supply of hat making resources. Remember, we have an unlimited capacity to customize your hat, on the spot, because we have created hat embellishments made from gorgeous flowers of all kind, exotic feathers & plumes, lace, netting, horse hair and many other exciting and unique materials. These hat additions can be clamped, pinned or glued onto your hat at the time of purchase. Prices range from Superior Quality Celeb Status Hats to Median & Economy Price Points. Our Golden Age of Hollywood Hats, like this Loretta Young Inspired Hat was created for The Mad Hatter’s Tea & Luncheon Annual Charity Event happening at the Dallas Arboretum. Come to Dallas Vintage Shop for the largest and most diverse collection of Vintage Hollywood inspired hats in the Dallas area. Many of our hats were created especially for the Golden Age of Hollywood theme and are one of a kind treasures. 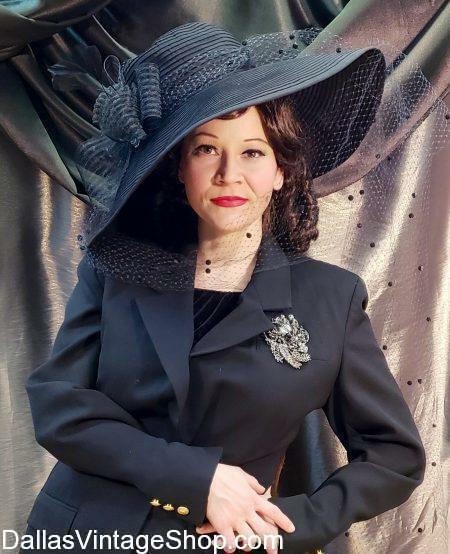 Golden Age Hollywood Hats, like this Loretta Young Inspired Hat, is just one of many Old Hollywood Ladies Hat Recreations you will find at Dallas Vintage Shop. Nobody in the DFW area has more Golden Age of Hollywood Hats. We have this Loretta Young Hat Recreation and many more one of a kind Old Hollywood Movie Star Hats in stock. Visit Dallas Vintage Shop for the largest and most diverse collection of Vintage Hollywood inspired hats Dallas has to offer. Our Golden Age of Hollywood Diva Inspired Hats are just what you need for the Dallas Arboretum’s Mad Hatters Tea. We have created many Hollywood Starlet famous hats and we are ready for the Mad Hatters Tea & Luncheon. ‘The Golden Age of Hollywood’ is this years Fundraiser’s Theme. Are you ready for the Hat Contest? No hat shop has better hat ideas than Dallas Vintage Shop. We have a Vintage Hollywood inspired Movie Star Hat Recreation for you. Come explore DFW’s best hat shop for The Mad Hatter’s Tea & Luncheon. This years theme, ‘The Golden Age of Hollywood’ is our specialty. You will want to experience the Dallas Arboretum’s fundraiser event with a glamorous or enormous hat from Dallas Vintage Shop. We will help you customize if you prefer, at the time of purchase. DVS is well prepared with an enormous extravagant flower collection, feather collection and broach collection for tweaking your hat. You must see the embellishments we have created to help your individualize your hat. These large and small hat corsages are designed to clip or clue onto your hat. These ‘unique to DVS’ creations that are ready for you to add to your hat will inspire you. Our innumerable hat broaches are fantastically beautiful unto themselves. They are made of feathers, netting, tool, flowers, horse hair embellishments along and many exaggerated, simple or gorgeous designs. Our hat adornments come is all colors and sizes imaginable. Find huge modern hat fashions or glamorous Old Hollywood hat reproductions that we keep in stock all year round. You will find Celebrity Status Exclusive Hat Creations to Beautiful Median and Economy priced hats. The Mad Hatter,s Tea and Luncheon hat of your dreams is waiting for you here. Dallas Vintage Shop can open up The Golden Age of Hollywood for you and properly prepare you for this or other Hat Events in Dallas. Come see the Dallas Arboretum Hat Collection while it is fresh and growing to accommodate the many Spring Hat Events you will find in our Events Calendar. Golden Age of Hollywood, Marilyn Monroe Inspired Hat for the Mad Hatters Tea. Get Mad Hatters Tea, The Golden Age of Hollywood, Dallas Arboretum Event Hats & Hat Suggestions at Dallas Vintage Shop. You will find many one of a kind hats that were made just for this event. These Old Hollywood inspired hats have already been selling, but don’t worry, we have many more. Our hat selection is virtually unlimited. We can help you customize your Mad Hatter Tea Party Hat right here on the spot. This Mad Hatters Tea & Luncheon, Golden Age of Hollywood, Marilyn Monroe Inspired Hat from ‘The Hat Sitting’ is perfect for the Dallas Arboretum’s Mad Hatters Tea. We have Dallas’ largest hat collection and we are ready for the Mad Hatters Tea this year. 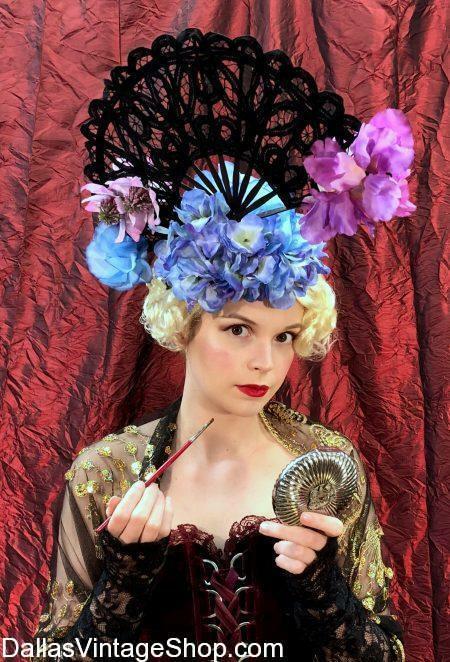 This year’s ‘Golden Age of Hollywood’ Themed Fundraiser will have the usual Hat Competition and nobody has better hat ideas than Dallas Vintage Shop. Get your own Vintage Hollywood inspired Movie Star Hat Recreation from our Silver Screen Inspired Hats. You will find DFW’s Best Hat Shop for Mad Hatters Tea and The Golden Age of Hollywood Theme is right up our alley. Stand out at the Dallas Arboretum with a glamorous or enormous hat that you can customize if you prefer, right here at the time of purchase. We are well prepared with the most unbelievable flower collection, feather collection and broach collection. We have created large and small corsages to clip or clue onto your hats too. These are ready for you to choose from and ready for you to add to your hat. These hat additions are beautiful unto themselves as they are made of feathers, netting, tool, flowers, horse hair embellishments along with many fresh and pretty features. These hat adornments come is all colors and sizes imaginable. Find gigantic modern fashion hats or Old Hollywood Glamorous Hats in stock, all year round. Take an unbelievable large or beautiful hat home with you today. Prices range from Celebrity Status Exclusive Hats to Median and Economy prices. Get the Mad Hatters Tea and Luncheon hat of your dreams. Let Dallas Vintage Shop open up The Golden Age of Hollywood, Dallas Arboretum Hat Collection for you. Posted in Mad Hatters Tea | Comments Off on Golden Age of Hollywood, Marilyn Monroe Inspired Hat for the Mad Hatters Tea. The Golden Age of Hollywood Hats, including this Marlene Dietrich inspired hat, is available now. Get ready for the Dallas Arboretum ‘Golden Age of Hollywood’ Themed Mad Hatter’s Tea & Luncheon. This year, and every year, the Dallas Vintage Shop has more Old Hollywood Vintage inspired hats than you would ever imagine, including many one of a kind special creations that will be gone when they are gone. The hats you see here may or may not be available but you can count on the fact that we will always provide you with other Hollywood recreations that replicate the original Hollywood Movie Star Classics. Or we can customize your hat for you from our encyclopedic collection of hat decorating paraphernalia while you wait. Yes, The Golden Age of Hollywood Hats are at Dallas Vintage Shop. This Marlene Dietrich inspired hat is just one of many Old Hollywood classic hat recreations we keep in stock all year round. We’ve added to our Golden Age of Hollywood Hats Collection for the Mad Hatter’s Tea & Luncheon Event so don’t miss out on your favorite Hollywood actresses classic fashion hat. Marlene Dietrich, the fashion queen, is one Movie Star that wore many inspiring, if not unique hats and we have some of them. You will also find other Movie Classic ladies iconic hats, flamboyant Hollywood famous hat recreations and prize winning Mad Hatter Tea Party hats that are plentiful all year round in our enormous hat collection. We are now showing off a few of The Golden Age of Hollywood Hats we have created especially for this years Mad Hatter’s Tea & Luncheon at the Dallas Arboretum. The Collection of Vintage Hollywood Hat recreations include this wonderful and unusual Marlene Dietrich inspired hat. Many other Hollywood Movie Star iconic hats are available and we always have classic Movie Star ladies hats and gigantic Dallas Arboretum Show Stopper Hats. We can customize your hat selection, on the spot, to make sure that no other person has a hat like yours. We are prepared for the Mad Hatter’s Tea. Are you? Come enjoy the largest and most diverse collection of ladies hats in the DFW area. Prices range form Exclusive Celebrity Quality Fashions to Moderate and even Economy Prices. We don’t want anyone to miss out on the hat of their dreams. You are in Mad Hatters Tea category.